ever since these union square bar nuts entered my life, seasoned and roasted nuts have screamed HAPPY HOLIDAYS to me. because my uncle first made them during the holidays; and because “holidays” is a euphemism for “socially acceptable gluttony,” and i may or may not have eaten way too many handfuls of them. so basically i’m a sucker for flavored nuts. meaning, if the oven’s on, that’s a good enough excuse to make a batch of these (i made these right after some granola). caramelly, crisp, coffee-y but not bitter, a hint of cinnamon that adds a cliche’d je ne sais quoi, these nuts are tasty. 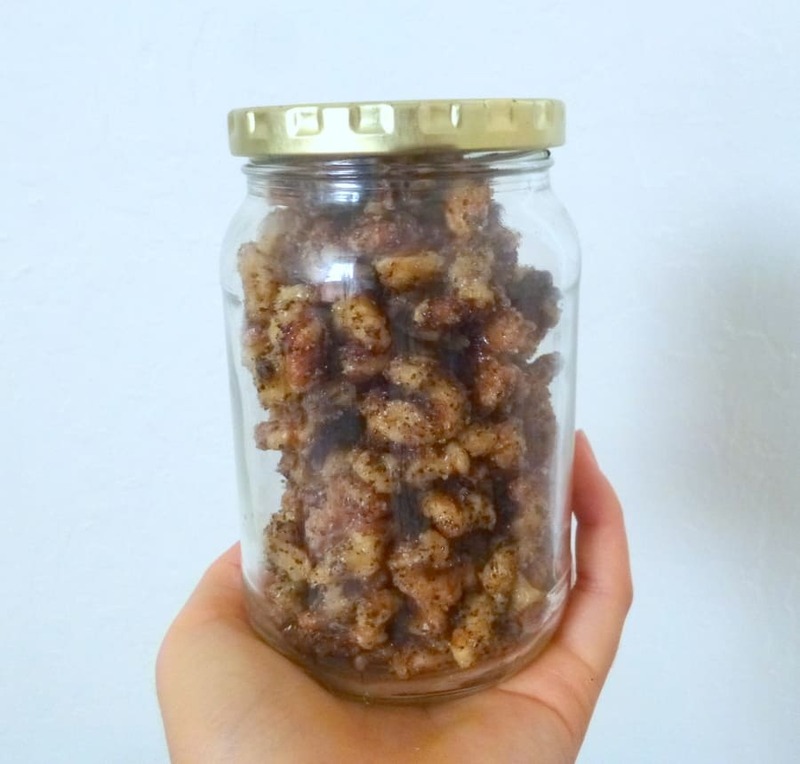 they have the perfect amount of sweetness for me; if you like candied nuts dessert-sweet or with a nice layer of caramel around them, then you might want to keep the original amount. in either case, be prepared to munch on them endlessly until there’s none left to give to people for their holiday gifts despite your good intentions. I didn’t use all the spiced sugar, though you can if you want (or, alternatively, cut the first four ingredients in half). You can stir any leftovers into coffee or milk, or use it for baking- there are some coffee almond shortbread cookies I’m sharing next week that you could definitely use this sugar in! Grease a baking sheet (I slapped down a Silpat. Parchment would also work). Whisk dry ingredients in bowl. Whisk egg white in another bowl until frothy. Toss walnuts in egg. Sprinkle nuts with the spiced sugar and toss to coat (you may not need all the sugar; I only used about half). Spread on baking sheet in single layer. Bake for 5 minutes at 325F. Stir, then rearrange in single layer. Bake until dry to touch, about 5 minutes. Loosen walnuts from sheet again; cool on sheet.